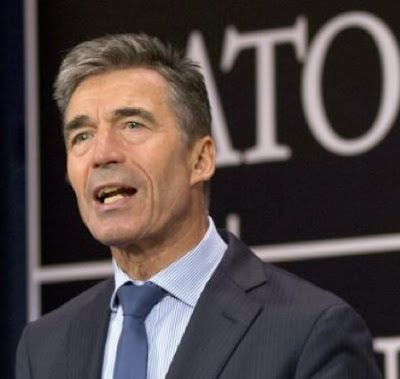 BRUSSELS, Belgium -- The head of NATO said he sees no signs that Russia is respecting its international commitment regarding Ukraine, and added that meetings Wednesday among NATO foreign ministers will address building Ukraine's military capabilities. NATO Secretary-General Anders Fogh Rasmussen speaks during a media conference at NATO headquarters in Brussels, June 25, 2014. Anders Fogh Rasmussen said Wednesday in Brussels that the foreign ministers, including U.S. Secretary of State John Kerry, will "review" relations with Russia and decide what to do next. Russia could face tougher sanctions from NATO countries if it fails to comply with requests to help end the violence between Ukraine loyalists and Russian separatists within Ukraine's borders. Moscow's annexation of Ukraine's Crimean peninsula in March sparked several rounds of U.S. and European economic sanctions against senior Russian officials. At NATO’s summit of foreign ministers, Kerry and his Turkish counterpart, Ahmet Davutoglu, stressed the importance of the relationship between their two countries. "Turkey is such a key partner in so many ways but particularly given what is happening in Syria and now in Iraq with ISIL," Kerry said after a handshake with Davutoglu, the Associated Press reported. Davutoglu also acknowledged Turkey’s proximity to southern Ukraine across the Black Sea. He said it was time for the U.S. and Turkey “to consult more frequently, act together as two strategic allies and that cooperation will continue in all fields," AP reported. In Moscow Wednesday, Russia's upper house of parliament voted to withdraw permission for Russian troops to go into Ukraine, fulfilling a request made by President Vladimir Putin on Tuesday to cancel that permission. On Tuesday, Ukraine said pro-Russian separatists near the Russian border shot down a Ukrainian military helicopter, killing at least nine servicemen. The downing near the eastern city of Slavyansk, a rebel stronghold, came less than a day after rebels announced a temporary cease-fire in their push to gain autonomy from the Kiev government. The truce was to have run parallel to a weeklong cease-fire declared by Kiev on Friday. The status of the Ukrainian government truce remained unclear late Tuesday. But Ukraine President Petro Poroshenko, in a statement, said rebels had violated their own peace offering. He also ordered government forces to open fire "without hesitation" if attacked. Poroshenko hailed Putin's request to withdraw permission to send troops as a "practical step" toward peace. NATO has accused Russia of supporting the separatists in Ukraine, but Russia denies it. In New York Tuesday, senior United Nations human rights official Ivan Simonovic warned the U.N. Security Council that the situation in eastern Ukraine is rapidly deteriorating. He said 423 people were killed in fighting in the east between April 15 and June 20, and said the cross-border flow of arms and Russian recruits to the region is increasing.